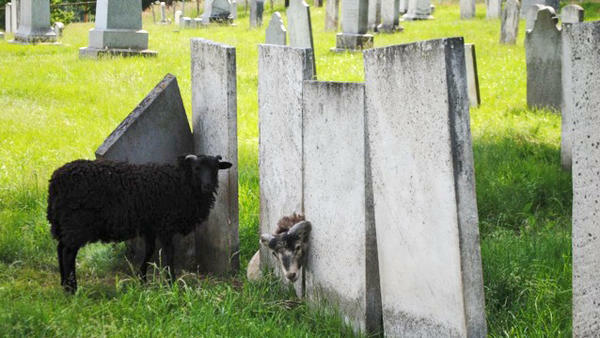 Charlotte, Vt., has a new, old-school strategy to keep cemetery grass cut: Let animals do the work. Cities and towns facing tight budgets have often neglected their cemeteries, an oversight that has left many of them in disrepair with broken fencing, crumbling gravestones, overgrown grass and persistent weeds. But this summer, the Vermont town of Charlotte implemented a new strategy to both save money and keep grass in the town's graveyards under control, and it's a decidedly traditional way of doing it: Let goats and sheep do the work. Stephen Brooks, who oversees two graveyards in town and smaller plots as chairman of the town's Cemetery Commission, admits it's all rather pastoral. He says it's also a financial necessity. "Depending on the time of year, sheep and goats can chew a higher percentage or a lower percentage of what needs to be chewed down in direct proportion to how fast the grass is growing," Brooks says. He figures these wandering animals — two goats and two sheep rented from a local farmer — have reduced the need to mow and fertilize, saving the town at least $2,000 in fuel costs this year. Before power mowers, grazing goats and sheep were one method towns used to keep the grass trimmed. In England, some towns still leave the work to the livestock. The move has proven popular here with those who say it's good for the environment. It's also been a hit with people like Charles Russell, who simply enjoy the aesthetic of sheep and goats grazing on a Vermont hillside. Russell is a farmer and seventh-generation Vermonter who also chairs Charlotte's Board of Selectmen. "I have ancestors that are buried in various cemeteries," he says. "I just think it's a great idea." Russell says nearly everyone likes the idea of using goats and sheep. "There was just this one complaint from one person out of state who didn't like the fact that the sheep were urinating and defecating on the hallowed ground," he says. But, he points out, lawn mowers and fertilizers aren't much cleaner. "I'd say it's not very respectful to spray gasoline and spray fumes all over the gravestones either," he says. Many of this town's earliest settlers have been buried for hundreds of years beneath slabs of granite. Now, they also lie beneath sheep and goats grazing on a scenic hillside in the Green Mountain State. Copyright 2018 Vermont Public Radio. To see more, visit Vermont Public Radio. Now a story about an old New England farm town trying to cut costs by returning to its roots, maybe literally. As Vermont Public Radio's Kirk Carapezza reports, officials from the town of Charlotte have found an efficient and eco-friendly way to maintain their most sacred public spaces. KIRK CARAPEZZA, BYLINE: Cities and towns facing tight budgets have often neglected their cemeteries. It's an oversight that has left many of them in disrepair: broken fencing, crumbling gravestones, overgrown grass and persistent weeds. STEPHEN BROOKS: This is our oldest cemetery in town. CARAPEZZA: Stephen Brooks is the chairman of the town of Charlotte's Cemetery Commission which who oversees two graveyards in town and smaller plots. BROOKS: We've really had a broad range of challenges, including very small cemeteries that have been entirely overgrown. CARAPEZZA: But this summer, Brooks found a creative solution to save for cemetery repairs. CARAPEZZA: His commission is renting two goats and two sheep from a local farmer and allowing them to graze the grass. Brooks admits that it's all rather pastoral, but he says it's also a financial necessity. BROOKS: Depending on the time of year, sheep and goats can chew a higher percentage or a lower percentage of what needs to be chewed down in direct proportion to how fast the grass is growing. CARAPEZZA: And he figures these wandering animals have reduced the need to mow and fertilize, saving the town at least $2,000 in fuel costs this year. Sheep and goats grazing on a hillside, tending to the field - before power mowers, it was one way towns kept the grass trimmed. In England, some still do. And it has proven popular here with those who say it's good for the environment and with those who simply enjoy the visual aesthetic of sheep and goats grazing on a Vermont hillside. CHARLES RUSSELL: I have ancestors that are buried in various cemeteries. I just think it's a great idea. CARAPEZZA: That's Charles Russell. He's a farmer and seventh generation Vermonter. He also chairs Charlotte's Selectboard. Russell says nearly everyone likes the idea of using goats and sheep. CHARLES RUSSELL: There's just one complaint from somebody, I think out of state, who didn't like the fact that the sheep were urinating and defecating on the hallowed ground. But I guess I would say I don't think it's very respectful to spill gasoline and spray fumes all over the gravestones either. CARAPEZZA: In a rush on a recent weekday afternoon, cars speed past Charlotte's oldest cemetery, where many of this town's earliest settlers have been buried for hundreds of years beneath slabs of granite, and now, beneath these sheep and goats, grazing on a Vermont Hillside. For NPR News, I'm Kirk Carapezza. Transcript provided by NPR, Copyright NPR.